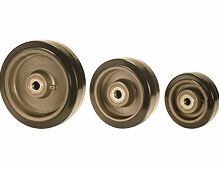 Muvtons black elastic rubber tyred wheels firmly chemically bonded to precision machined cast iron cores. 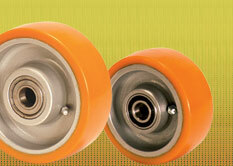 Highly resilient 75° ±5° Shore A rubber provides very smooth and silent running. Can be used for power towing applications by suitably de rating the load capacity. 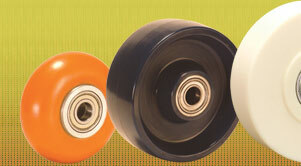 Wheel bearing options: Sealed precision ball bearings, tapered roller bearings or roller bearings. 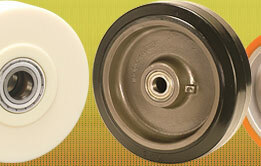 Temperature range : -20°C +75°C Tread Options: Anti Static, conductive and oil resistant wheels are available.